Pre-heat oven to 210°C/410°F. Slice sweet potato approx. 1-in. thick. Peel and cut onion into wedges. Peel and finely dice garlic. Melt coconut oil in a small pot over low heat. Add sliced sweet potato, onion, shredded coconut, melted coconut oil, garlic, sea salt, and pepper to a baking sheet and toss to coat. Bake at 210°C/410°F for approx. 20 min. Then remove from the oven and let cool down a bit. Peel and chop ginger. Transfer sweet potato mixture to a blender. Add ginger, lemon zest, hot vegetable stock, and orange juice. Blend for approx. 40 sec. on high, or until the mixture is smooth. Season with salt and pepper to taste. Add coconut flakes to a pan set over medium heat and toast until they are slightly browned. Transfer soup to serving bowls. 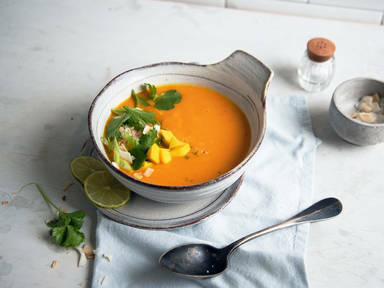 Serve with diced mango, toasted coconut flakes, sliced green onion, chopped cilantro, and lime zest on top. Enjoy!